The River Walk subdivision is a new home community located in Eagle, Idaho. New home construction began in 2015. Phase 1 is sold out. Phase 2 has six homesites remaining. Choose your perfect River Walk lot for sale and have your dream home built by the builder of your choice. View our Eagle homes for sale or read more about River Walk real estate below. 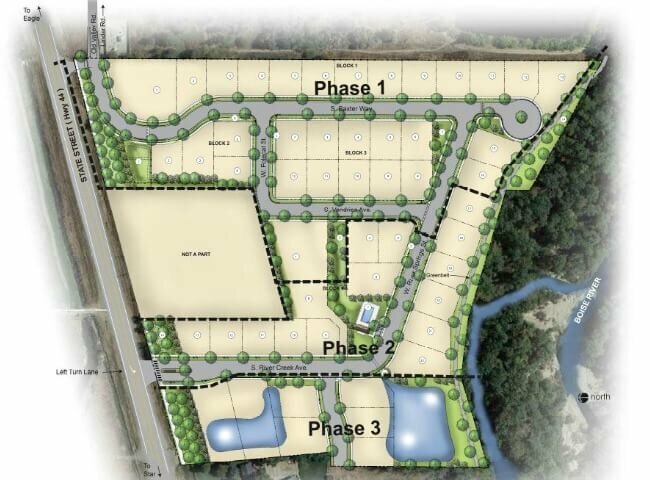 Homesites: 52 building lots ranging in size from 0.18 acres (7,840 Sq Ft) to 0.60 acres (26,136 Sq Ft). Browse all new homes in Eagle Idaho or view the complete guide to new Eagle Subdivisions. From W State St (Hwy 44) and N Linder Rd head West on State. Turn left (south) on S River Creek Ave. Looking for the best neighborhood to call home? We can help, contact us online or call (208) 391-4466 and see for yourself what hundreds of happy Eagle real estate owners already know.